OVERLAND PARK, KS – Kyu Sung Woo Architects, the internationally renowned architectural practice headquartered in Cambridge, Mass., has received the Honor Award at the AIA Central States Design Excellence Awards for their design of the Nerman Museum of Contemporary Art (Overland Park, KS). The Honor Award, which is given to select projects that are deemed exemplary in detail, context and execution, is the highest recognition bestowed by the AIA Central States. “This is Architecture,” declared Jane Weinzapfel, Principal of Boston’s Leers Weinzapfel Associates. The museum, home to a significant collection of contemporary artists including: Dana Schutz, Kehinde Wiley, Uta Barth, Kerry James Marshall and Do-Ho Suh, has brought an exciting new presence to the campus of Johnson County Community College and serves as the starting point of a campus-wide art installation program. 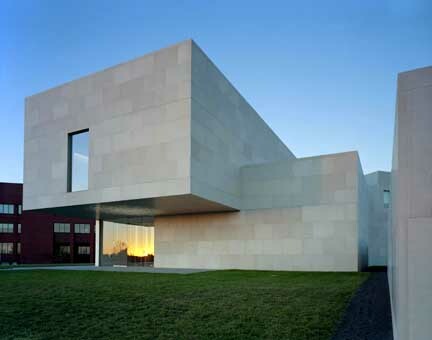 OVERLAND PARK, KS – Kyu Sung Woo Architects, an international architectural practice headquartered in Cambridge, Mass. 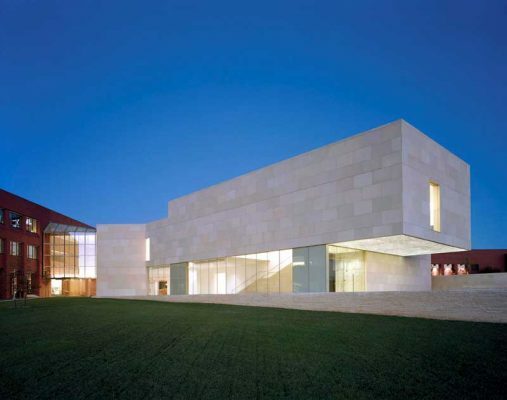 has designed the new Nerman Museum of Contemporary Art in Overland Park, KS. The museum, home to a significant collection of contemporary artists including: Dana Schutz, Kehinde Wiley, Uta Barth, Kerry James Marshall and Do-Ho Suh, will bring an exciting new presence to the campus of Johnson County Community College and will serve as the starting point of a campus-wide art installation program. Kyu Sung Woo’s contemporary, minimalist building makes a strong statement. This limestone clad and glass enclosed modern structure signals a new entrance to the campus and connects the school to the community. The museum entrance faces outward towards the main streets and a 1.5 acre front lawn leading to the campus, an impressive site for future acquisitions. A dramatic 22-foot cantilever of the main gallery space above the entrance is enhanced by an exterior installation by artist Leo Villareal. His stunning LED display extends the lantern-like effect of the glass façade and supports the connection to the landscape established by the building. The glass-enclosed lobby runs along one side of the museum front, providing a broad view of its interior from afar and giving a constant sense of activity within. Retaining walls, extending into the landscape, further define the exterior garden, enforce the connection of building to land, and help form the visitor’s path. The exterior treatment reflects local materials and context; the selection of limestone for the cladding was in part inspired when excavation revealed this to be the naturally occurring subsurface rock on the site. The interior provides flexible exhibition space for permanent and temporary shows, as well as educational and social spaces that further connect the museum to campus activity. In the Museum, art and architecture are experienced together as a part of daily life. Daylight is drawn into the building along its perimeter with clerestory skylights that bring light down to wash the walls, creating an association with the outside, a sense of openness and a connection to the passing of time as the quality of light shifts. 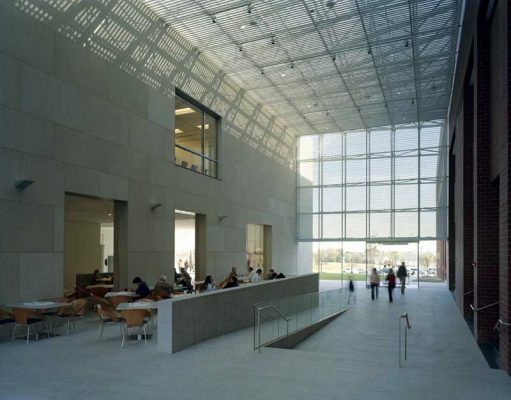 A double-height atrium wrapped with perforated metal to filter and soften light joins the museum to an adjacent technology center and integrates the museum into campus life. The museum establishes a new identity for this 234 acre suburban Kansas City campus. Located within the traditional Midwestern mile-square grid, Johnson County Community College is home to a renowned and notable collection of contemporary art that students encounter throughout their day-to-day lives, from walking to class to taking meals at the dining halls. Rather than compete with the large campus, Kyu Sung Woo found the opportunity for this new building to become a catalyst for a new experience of the site: the start of an art-walk and the entryway to a journey of art on campus. Architect of record on the project: Gould Evans Associates. Kyu Sung Woo Architects creates memorable spaces reflecting the emotional and functional needs of the people who will use them. From university housing to urban complexes, the firm designs buildings and environments that restore the meaning that architecture can bring to the individual’s daily life. Current work includes the Asian Cultural Complex, a 1.4 million square feet urban scale project in Gwangju, Korea. Founding Principal Kyu Sung Woo brings to each project his commitment to understanding deeply what the program does and will mean to its many stakeholders. 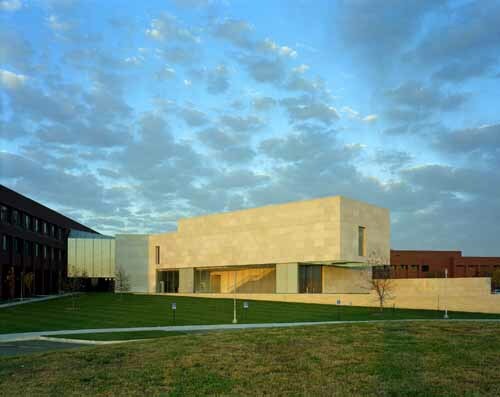 When the Nerman Museum of Contemporary Art opens on the campus of Johnson County Community College in October 2007, it will be the largest contemporary art museum in a four-state region and the only contemporary art museum in Kansas. Since 1983, JCCC, Overland Park, Kan., has been collecting contemporary art from around the globe. Today, the work of more than 600 local, regional, national and international artists is represented in JCCC’s prestigious collection, which features a diverse range of painting, photography, clay, sculpture and works on paper. In April 2006, Public Art Review magazine named JCCC as one of the top 10 university/college campuses for public art in America, citing the outdoor sculpture and the hundreds of paintings, ceramics, photography and works on paper installed throughout the campus. JCCC, long considered one of the best community colleges in the country, is Kansas’ third largest institution of higher education and the largest of its 19 community colleges.